Polylithionite is normally not a great looking mineral. 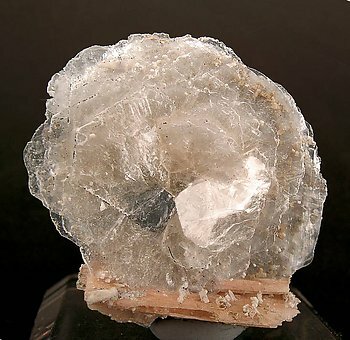 In this case the spray of crystals, nice pearly color, and the Serandite matrix make it appealing. It is an undamaged floater. A nice sample of an uncommon mineral. 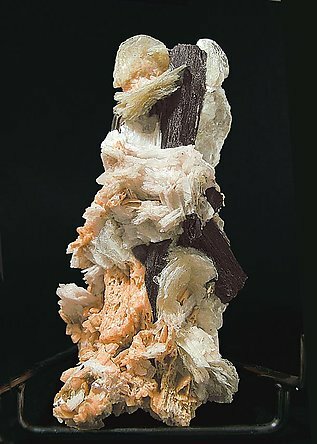 A very complete specimen in which not only do the magnificent crystals of Polylithonite stand out but also the large (for this locality) crystal of Aegirine and the reasonably well-colored Serandite. Just to complete this mix there are also some small yellow crystals of Leucophanite. It is a floater that is complete and it shows the best characteristics of Mont St. Hilaire: complexity, rarity, and beauty all at the same time. A great specimen.